(Bloomberg Opinion) -- When I use Google Maps, it gives me several options, but I usually take the one it highlights without thinking too much about it. Meanwhile, the IEA’s own projections show just how big a difference tenths of a degree can make. In its 2016 edition of the WEO – published the year after the Paris Agreement was signed – it sketched out a 1.5-degree analysis to supplement what was then its lower-carbon scenario, “450” . While the numbers are slightly out of date, a quick look at the IEA’s projections for oil and gas demand in 2040 under the different scenarios provides a sense of just how big a difference targeting a few tenths of a degree less can make. 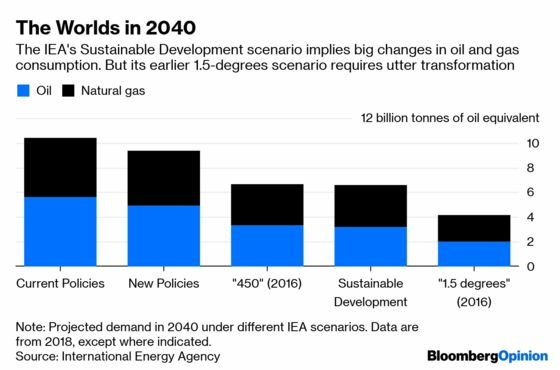 Whereas the Sustainable Development scenario projects global oil demand dropping to 63 million barrels a day in 2040 – more than a third below today’s level - the 1.5-degree scenario takes it below 40 million, a level last seen in 1968. Natural gas demand, meanwhile, flips from being roughly flat with today’s level under Sustainable Development’s assumptions to dropping by more than a third, back to where it was in 1999. In some ways, that gas figure is even more shocking, given the widely held view that it will come into its own and act symbiotically with renewable energy. The IEA even touted a “Golden Age of Gas” scenario in its 2011 outlook, and oil majors have invested billions in turning themselves into Big Gas. This scenario, first introduced in 2008, aimed to set out an energy pathway limiting greenhouse-gas concentrations in the atmosphere to about 450 parts per million of carbon-dioxide equivalent.